The Hong Kong Arts Festival, now in its 44th edition, is the largest performing arts event on the city’s cultural calendar, if not in scale then certainly in its ability to bring together world class artists. Of the big names in this year’s line-up, the 276-year-old Teatro Regio Torino led by music director Gianandrea Noseda has generated the most buzz among classical music fans. Named 2015 Conductor of the Year by Musical America, Noseda has made great strides in introducing Teatro Regio Torino to audiences outside Italy, including a U.K. and North American début in 2014. In its first trip to Hong Kong this spring, the troupe performed Verdi’s Simon Boccanegra and Messa de Requiem, as well as two orchestral concerts featuring works by Prokofiev, Wagner and Shostakovich. 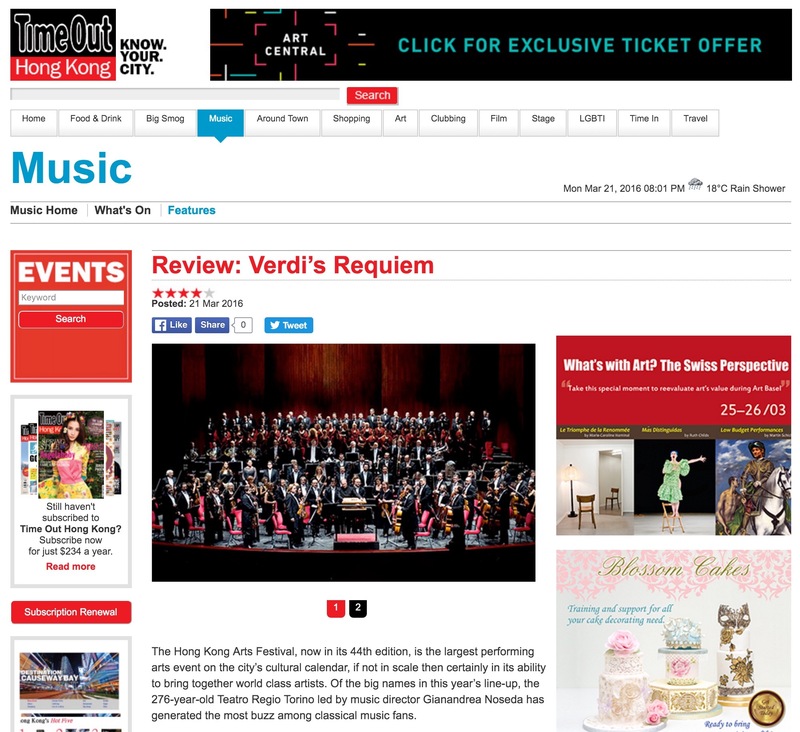 I went to Verdi’s Requiem on 3 March 3. The Cultural Centre’s Concert Hall might have been the city’s most prestigious venue for classical musicians and our answer to Carnegie Hall and Covent Garden, but its diminutive stage proved problematic for a composition scored for a full orchestra and a double choir. The four soloists were wedged behind the second violins, instead of being placed at the front of the stage the way the requiem is typically performed. The small-framed soprano Erika Grimaldi almost had to stand on tiptoe to be seen. If the hall was undersized and cramped, then the sound of its guest performers was anything but. 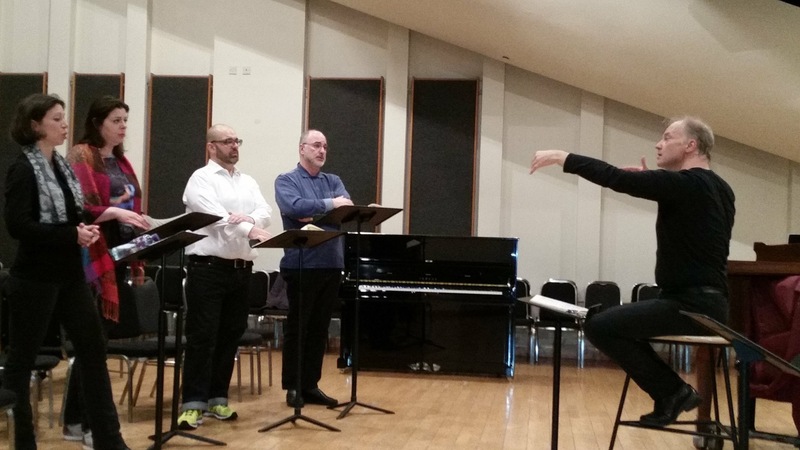 After floating the sombre introduction in paper-thin pianissimo in the opening Requiem e Kyrie—the first of seven sections—the chorus launched into a thunderous liturgical declaration before the soloists took over with an impassioned plea for mercy. The chorus was in full control of the work’s dramatic mood swings: explosive when the climaxes hit and buttery smooth during the intervening lulls. The second section, Dies Irae (Day of Wrath), is not only the longest but also the most operatic and emotionally charged. Its famous five-note onset, aided by the timpani and bass drum playing in off-beat syncopation, gave the orchestra and chorus ample scope to showcase their dramatic flair. In the Tuba Mirum (the Wondrous Trumpet) subsection, two antiphonal trumpeters played from behind the audience on the balcony level to create a literal “surround sound” effect, painting a musical version of Michelangelo’s Last Judgment. The piercing notes of the brass, suffused with contrasting beauty and menace, gave the audience chills. The stand-out stars of the evening was soprano Erika Grimaldi. Her slight figure belied a megawatt of power, filling the small hall with her big voice from the first note in Requiem e Kyrie right down to the haunting finale Libera Me (Deliver Me) in which she asserted her prima donna dominance. Not to be outshone, Tenor Giorgio Berrugi exuded remarkable charisma and cruised through the high notes with a vocal clarity that recalled the late Franco Corelli. Mezzo-soprano Daniela Barcellona and bass Michele Pertusi both held their own, although one might expect more nuanced phrasing from performers of their stature. As for Gianandrea Noseda, the award-winning music director did not disappoint. He was meticulous, disciplined, and exacting almost to a fault—more spontaneity and less restraint would have been preferred. 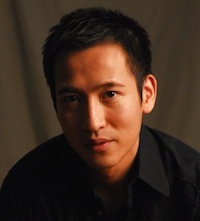 Overall, the star conductor succeeded in bringing measured drama to a piece that was often criticized for being overly dramatic by traditionalists at the time of its composition. This review was published in the online edition of Time Out Hong Kong.